Celluloid Junkie is proud to have partnered with Vista Entertainment Solutions (VES) for the Cinema of the Month series. Vista is the world’s leading cinema ticketing and software solutions company. We won’t just be featuring cinemas whose operators use Vista, but we will surely mention when that is the case. CJ would like to thank everyone at Vista for enabling us to showcase some of the most interesting, innovative and inspiring cinemas from around the world. “Photography is strictly prohibited,” is a phrase I heard more than once while at the Kino International. This was not directed at would-be pirates pointing their camera at the screen, but anyone who tried to take a picture anywhere inside this palatial cinema. Selfies are about as welcome as someone farting loudly at a gala premiere screening, of which Kino International has seen its fair share in the past fifty-odd years. 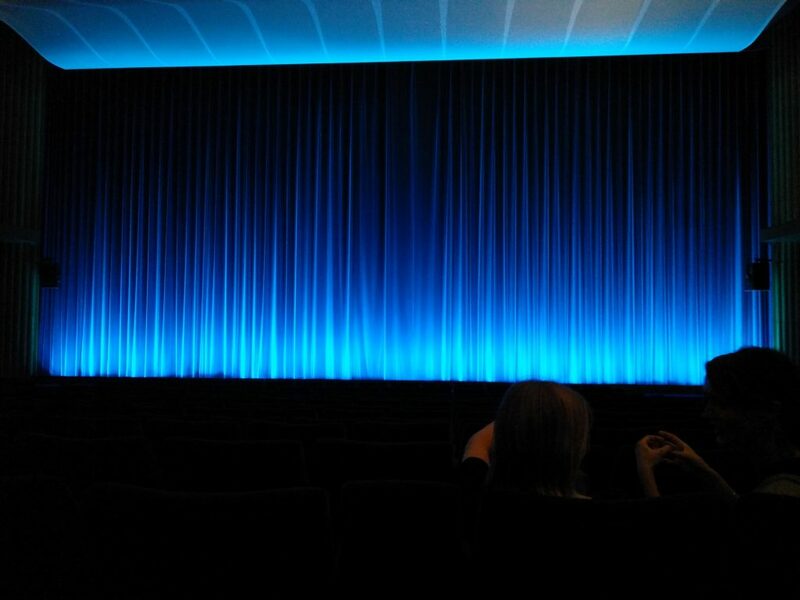 While the Zoo Palast cinema in West Berlin tends to grab more attention – particularly after its extensive and expensive refurb – it is Kino International that best lays claim to being the German capital’s most impressive single-screen cinema. The movie theatre is stunning enough to merit its own coffee table book treatment, which is perhaps not surprising given that it was at one time the flagship cinema of the former German Democratic Republic (GDR). 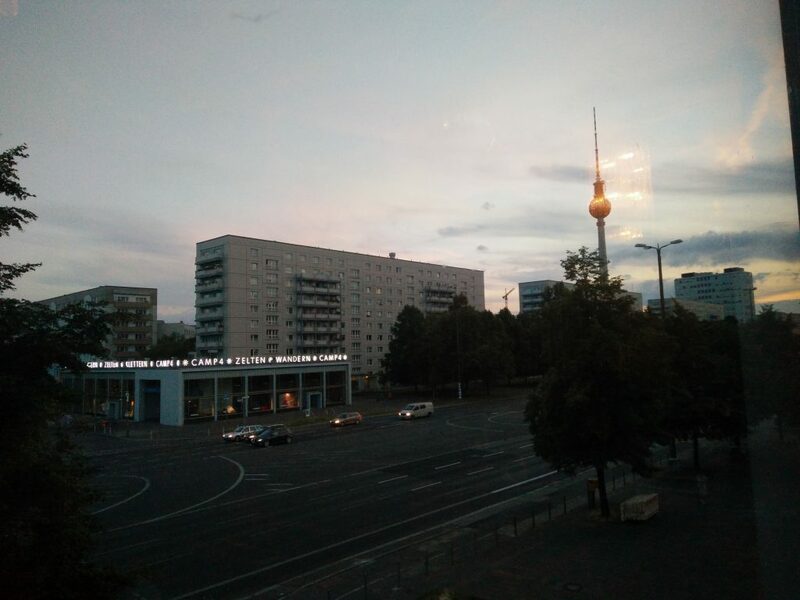 Overlooking the ridiculously wide Karl-Marx-Allee – a boulevard originally called Stalin Allee and created to show off the Warsaw Pact’s military hardware on May Day – the Kino International was built between 1961 and 1963, the same time as the Berlin Wall was erected. It finally opened on 15 November 1963 as a showpiece for East Germany’s film art and architecture with the Soviet revolution blockbuster “An Optimistic Tragedy“. Kino International was the cinema for the grand premieres of East Germany’s state-owned DEFA film studio for over 25 years. The final such film opening there was “Coming Out”, the first ever GDR film to deal with homosexuality, premiering 9 November 1989, which in a twist of fate also happened to be the night the Berlin Wall came down. 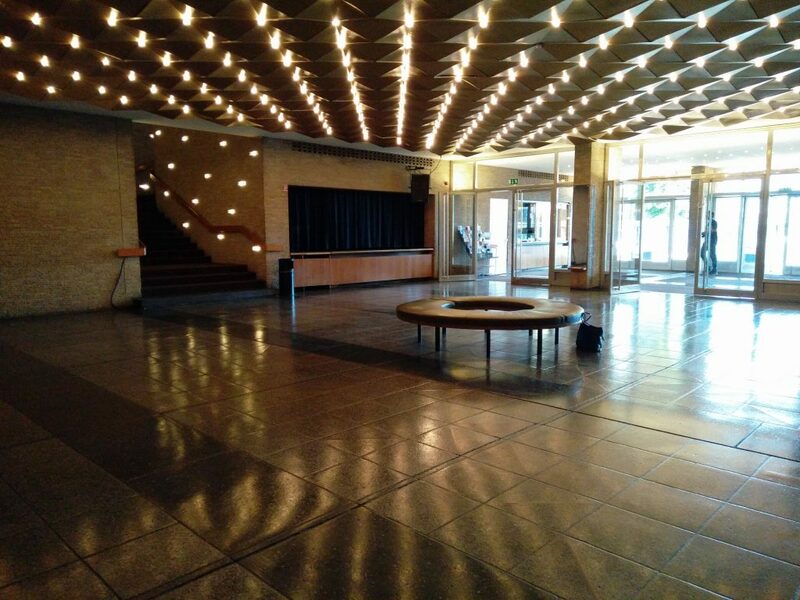 The end of the GDR also meant the temporary end of Kino International. The cinema was subsequently renovated and re-opened in 1990. Since 1992 it’s been part of the Yorck Group of cinemas, which dominates Berlin with 11 locations across the city. Kino International is currently home to many of the premiers of the Berlinale (Berlin Film Festival), as well as the Russian and French Film Weeks, while functioning as a regular cinema during the rest of the year. It is also one of the last cinemas in Germany, if not the world, to feature giant hand-painted posters of the main film playing adorning its facade. Built in the second wave of construction along Karl-Marx-Allee that also included Cafe MOCKBA (Moscow) opposite it, Kino International was designed by Josef Kaiser and Heinz Aust, who had previously built the now-closed Kino Kosmos further down the boulevard. Anyone wishing to get the details of the design of the buildings can head over to the detailed Kino International profile on Wikiarquitectura. The 551-seater was created to be at the cutting edge of mid-century cinema design, including inclined seating, a sloped ceiling, with the walls further covered in acoustic damping panels. In the 1980s it became one of the first cinemas in the Eastern Block to be equipped with Dolby Stereo. But more than premium cinema design, the theatre was designed primarily with the Socialist Unionist Party (SEP, better known as the Communist Party of the GDR) in mind. The cinema had eight rows of seats with optimal viewing and extra leg room, reserved for senior party functionaries. In addition to the auditorium and entrance, there was also a library and an office of the Oktoberklub music association. Later additions to the cinema included a small bunker and elevator for the GDR apparatchik, so they could flee and take cover in case western imperialist NATO forces sneakily launched a nuclear attack during a film premiere. Sadly these spaces are off limits to the ticket-buying public today. “If it was up to me, you would be free to take pictures,” the cinema staff member whispered conspiratorially, “but my boss is here, so I could get in trouble if he sees you.” I was instantly transported back to the Communist era day of repression, informers and covert dissent against the Socialist order. Hopefully nobody would report this poor comrade to the Stasi secret police for suggesting that rules be broken. 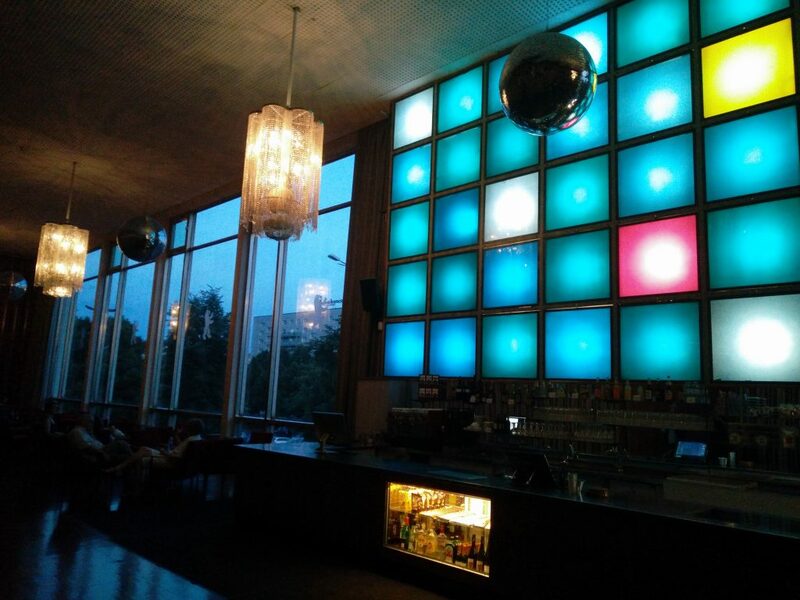 Walking through the Kino International you cannot help but to soak up the Communist era feeling that has been preserved and delicately upgraded with LED lights and other discreet touches. The western make of the concessions on offer and the modern point-of-sale are the only give-aways that we are not still in the time of repression and paranoia, as depicted in “The Lives of Others”. One can quite easily imagine oneself a Party Bigwig having a drink with Manfred Krug, Erwin Geschonneck or other DEFA stars of those days. The velvet seats are comfortable and both the sound and picture are of the highest possible quality, having been upgraded to digital and with no less attention paid on the standard of the equipment behind the scenes than the interior. Yorck might not have been the first chain to go digital in Germany, but still maintain a quality of presentation that is exemplary. Smaller distributors sometimes grumble about the strong grip that Yorck exerts on the independent and art-house market in Berlin, sometimes, it is alleged, at the expense of programming of smaller independent cinemas. However it also guarantees solid programming of the best art-house fare, even as nominally art-house operators like Picturehouse and Everyman in the United Kingdom increasingly also program the latest James Bond and Star Wars installments. On my visit it was “Vor der Morgenröt” about author Stefan Zweig’s exile in the Americas, playing in its third week. Each film is preceded by trailers for operas and classical music concerts. Not event cinema live projections of these, mind you, but the actual events themselves. This is the power of programming a network of 11 premiere art-house screens in one of the main cultural capitals of Europe. The film had a good turn out, even for an art-house hit, given that it was the middle of the week, several weeks into its run. 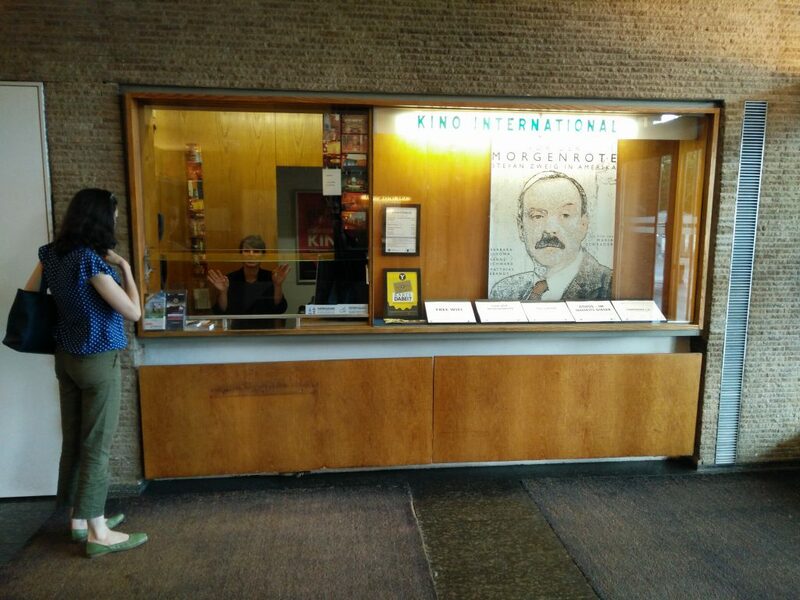 Kino International is obviously keen to protect its image – hence the draconian ‘no photography’ blanket ban. But for all its retro ‘Verboten’ inclinations, it cannot also help being part of the anarchic and bohemian alternative Berlin. After the film we did not stay for a drink but headed across the road to the no-less retro Babette Bar, which used to be a cosmetic shop in GDR days, but today is a trendy hangout for the hipsters of the Friedrichshain neighbourhood. At the end of the evening we managed to successfully smuggle our digital camera roll, concealed inside a ‘mobile telephone’, past the Checkpoint Charlie museum in Mitte and back into western Berlin to share with you this Crown Jewel of a cinema on the other side.